Page 289 of PowerPoint tutorials, presentation essentials, personality interviews, and PowerPoint news. Have you ended up with a presentation that has linked files, embedded media clips, and so much more? And now you have been asked to copy the entire presentation and all linked files to a CD? Burn a CD in these times? How ancient is that? Let's rephrase that question: have you ever been asked to copy all the content for a presentation to a folder, a network location, or a USB drive? PowerPoint provides the Package Presentation for CD option that can do this task for you, with just a click or two. Don’t go by the CD mentioned in this feature name, because you can use this option to burn both data CDs and DVDs and also copy all content to a new folder. Learn how to package a presentation to a CD or a folder in PowerPoint 2016 for Windows. We feature Rick Altman, host of the upcoming Presentation Summit conference in San Diego. He talks about the sessions and the topics being covered this year, and also the new and returning speakers. We look at sites where you can get animated GIFs, and products that help you create them. We also have a special feature that looks at creating animated GIFs from PowerPoint slides. PowerPoint 2016 for Windows users can learn about open and closed motion paths for animations, and how you can lock or unlock such paths. PowerPoint 2016 for Mac users can learn about adding more Guides, and working with them more effectively. 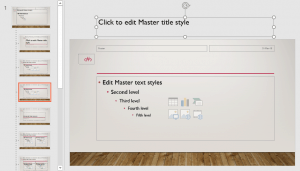 Plus, we also have a tutorial on Slide Layouts within Slide Master view. And if that wasn’t enough for this week, make sure you do not miss the quotes, press releases, and templates released in the last seven days. Motion Path animations determine the route (path) and the direction in which the animated slide object moves across or around on the slide. When you add a motion path animation to an object, you see the path as a dotted line with two arrow-heads. PowerPoint 2016 sports a faded preview of the animated slide object at the end point of the motion path. Explore Position Previews for Motion Path Animations in PowerPoint 2016 for Windows. Slide titles are very important. First of all, they identify a slide. Secondly, they provide structure to your presentation, because anyone who uses PowerPoint’s Outline view will not be happy to see slides without titles. So why do we hear some people say that they do need slide titles, but they don’t need them to be visible. In other words, they need hidden slide titles. While working with Motion Paths, especially after drawing a Custom Motion Path to animate your slide object, you may feel that the path drawn is not very smooth. Or you may have used one of the Preset Motion Paths to animate your slide object, and now you want to make some changes. Maybe you want to extend the path or use smoother corners rather than the default pointed ones. Drawing with a mouse typically does result in paths that don't look too good! Since Motion Paths are essentially lines drawn in PowerPoint, you can always edit them using the Edit Points option, and reorient them as required. When most people use Motion Path animations, the feature they probably use the least is locking and unlocking the Motion Paths. That may be because these options are not too well documented. But that’s no reason to ignore this option. Especially, since locking and unlocking Motion Paths can help you create better animations. Animated GIFs used to be very popular like twenty, or twenty-five years ago, and then they just faded away. And now, they have made a comeback. So it’s not surprising that I have started hearing from so many Indezine readers, who want to know how they can create animated GIFs using PowerPoint. Yes, this is certainly doable, although there’s no direct Save as Animated GIF option yet. While changing the Slide Layout for any given slide(s) in PowerPoint 2016 for Mac, you typically access the Home tab of the Ribbon and click the Layout button. This brings forth the Layout drop-down gallery. The number of Slide Layouts that you see within this gallery may differ depending upon the Theme of your active presentation. However, with PowerPoint's default Office Theme applied, you may see 11 layouts. So, where do these Slide Layouts come from? What influences how they look, or how the placeholders within them are laid out? To find out answers to these questions, you need to access Slide Master view within PowerPoint. To begin, let's start with the basics. What are Guides in PowerPoint? Consider Guides as individual lines from a grid on your slide that you create. Each single Guide can be moved, added, or deleted. Guides also have snap options that are always on. Once the Guides are made visible on the slide, all objects that venture close enough to them just snap. Along with Rulers, Guides help you position your slide objects with more precision, and you can make them work for you using techniques explained on this page. Learn how to work with Guides in PowerPoint 2016 for Mac. We begin with an exclusive conversation with Kurt Dupont of PresentationPoint, who talks about PowerPoint dashboards. We also feature Jamie Garroch, who talks about his new PowerPoint add-in, PPT2GIFa Lite, that lets you create animated GIFs from within PowerPoint. We then explore how you can sign out and switch Accounts in PowerPoint 2013 on Windows 10 and 8. PowerPoint 2016 for Windows users can learn about drawing custom Motion Paths for animations, signing out and switching Accounts, and the Account option in Backstage view. You can also explore reversing the path for Motion Path animations. PowerPoint 2013 for Windows users can learn about the Explore option in Backstage view and signing in, signing out, and switching Accounts. PowerPoint 2016 for Mac users will find useful information about changing Background Styles in the Slide Master. And if that wasn’t enough for this week, make sure you do not miss the quotes, press releases, and templates released in the last seven days. Rick Altman has been hired by hundreds of companies, listened to by tens of thousands of professionals, and read by millions of people, all of whom seek better results with their presentation content and delivery. He covers the whole of the industry, from message crafting, through presentation design, slide creation, software technique, and delivery. He is the host of the Presentation Summit, now in its 16th season as the most prominent learning event for the presentation community. In this conversation, Rick talks about the upcoming Presentation Summit conference, being held in San Diego from September 23rd to 26th, 2018. Motion paths are paths (or lines) through which slide objects animate. These motion paths are like any other line with curves, points, etc. If you are familiar with the Line, Curve, Scribble, and Freeform drawing tools in PowerPoint, you know that paths can be either open or closed. A circle is a good example of a closed path, whereas an arc is an open path. So, how is the concept of open and closed paths relevant to Motion Path animations in PowerPoint? Learn to reverse paths for Motion Path animations in PowerPoint 2016 for Windows. Learn how you can apply Background Styles within the Slide Master in PowerPoint 2016 for Mac. You May Also Like: Custom Backgrounds for Slide Master and Layouts in PowerPoint 2016 for Mac | PowerPoint Feedback and UserVoice: Does This Go Anywhere?